@ Double R Pub in Rogue River 5-23-14. Great Scott! Much has transpired since the last blogging of the band's Legendary Deeds! So many faces have been melted into gooey rock puddles! How ever shall we begin to chronicle months of Rock n Roll Mischief? Like this totally epic night in Rogue River waaaaay back in May... the first three rows of females accidentally became pregnant simply by listening to TLG's new songs! For legal reasons, and because several paternity suits are pending, The Legendary Goodtimes consider this mass impregnation to be a totally unrelated coincidence. Also rocking that night was Ponderosa Breeze, friends of The Goodtimes and all-around cool guys. @ The Rockytonk Saloon in Medford 6-8-14. And what about the Battle of the Beards back in June? The band hasn't seen that many bearded ladies since their last tour of Kazakhstan. The dudes had some impressive facial hair, too. Sharing the stage for the first time that evening was Buckle Rash, the local punk-country phenomenon--awesome bunch of guys with high energy tunes. Highly recommended Southern Oregon music, so say All of Us. This kid was on crutches just moments before--the power of Rock healed his body, and he expressed the Joy of Music through this interpretive dance. TLG was stoked to play the wedding reception of their friends Michael and Stephanie in August. These two crazy kids have been to so many Goodtimes shows, they've almost earned Honorary Membership in the band. All ages shows are always some of the best, and this one was a prime example. The kids joined the band onstage for much of the performance, dancing and Rockin Out. Too much fun. A room full of dancing girls, booze, and music. You've been to a Goodtimes show, right? You need to go. Seriously. @ Cattlemen's in Rogue River 8-22-14. The band returned to one of their favorite venues on Planet Earth, Cattlemen's Saloon in Rogue River, with the express goal of makin' booties shake. Mission accomplished. Matt got up on the bar (with the owner's permission, of course). David made several ladies swoon (from a safe distance, of course, as he also got married a few weeks prior). Mark played his drums so fast, the music actually ripped a hole in the space time continuum, nearly creating an alternate universe where all matter is replaced by solid Rock. Amazing. @ Howies on Front 8-30-14. Oh snap! The boys brought their song and dance to Howie's on Front, delighting the Medford late night crowd with marvelous Acts of Rock. Opening the evening was a very new band in the local scene, The John Dough Boys. Have you seen them, have you heard of them? You should. Rowdy blackgrass awesomeness abounds. Matty recently recorded their debut EP at the Goodtimes Ranch, and it sounds pretty damn good. Dialing in the sound at Bluejay Audio. Early in September, TLG spent the day with their favorite recording engineer, Mark Thomas Johnson of Bluejay Audio. The boys hauled their gear out to the Bluejay studio in Jacksonville to make a few test recordings for their upcoming second album. You may remember that Johnson recorded the first TLG album to analog tape back in 2012, a feat the band is preparing to repeat this Winter. Stay tuned for more info on the new record! October 3rd!!! 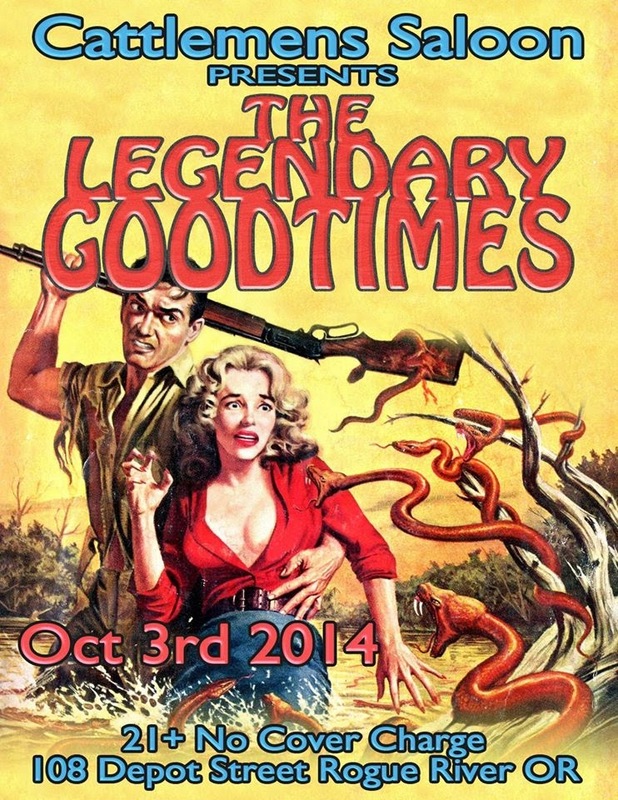 The Legendary Goodtimes will save Cattlemen's Saloon in Rogue River from snakes! By hitting them. With a gun. Yeah. Wowie! That almost brings this Time Machine up to the present day, but there are still THREE more shows to chronicle from the past month, so check back soon for A Legendary Trip In A Rock n' Roll Time Machine: Part II! In the meantime, come hang out with The Goodtimes in Rogue River on October 3rd, hear music destined for the upcoming second album, and share in an Evening of Massive Feats of Rock! See ya then.